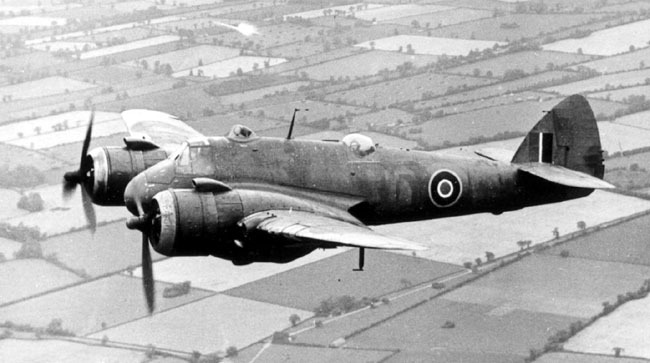 Bristol Type 156 Beaufighter: The Bristol Beaufighter was designed by L G Frise as a two-seat four-cannon long-range fighter using the wings, tail unit and landing gear of the Beaufort for speed of production. 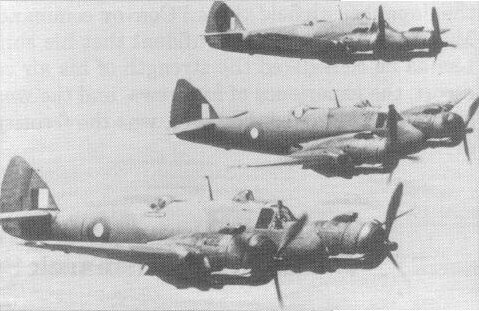 First of four prototypes (R2052), with Hercules I-SM radials, flown on July 17th 1939, second prototype had Hercules I-M, third had Hercules III and fourth had Hercules II. 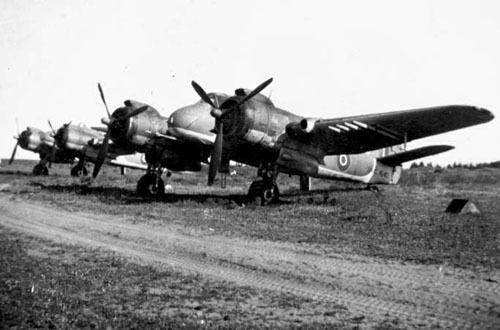 Bristol Type 156 Beaufighter I: First production contract placed in July 1939 for 300 (including the four prototypes) with 1,400hp Hercules III’s. 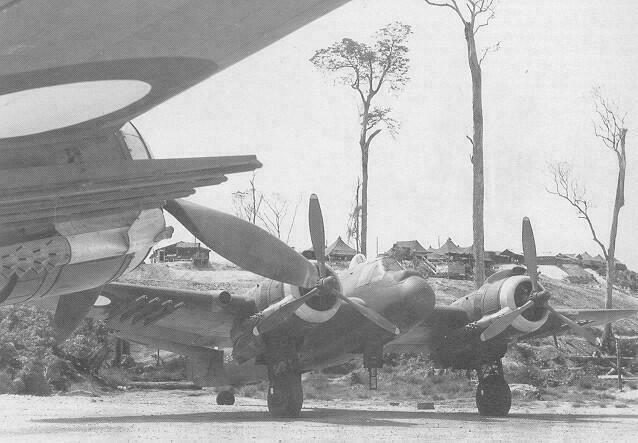 The first 50 were armed with four 20mm Hispano cannon in the nose, subsequent aircraft also had six 0.303” (7.7mm) guns in the wings. The last 120 Filton built aircraft were fitted with Hercules XI engines. 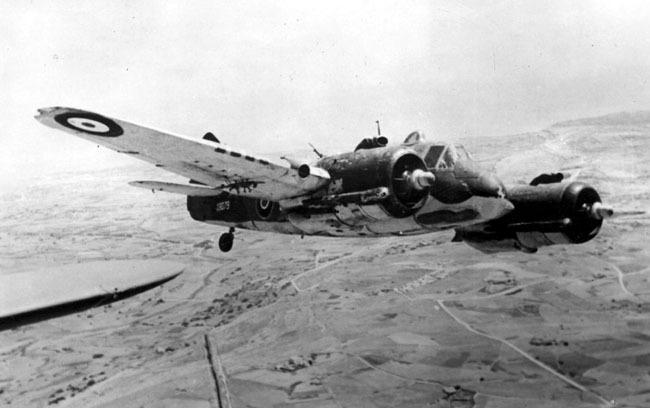 Deliveries to the RAF began on 27th July 1940 to No’s 25, 29, 219, 600 and 604 squadrons. Most of these were fitted with AI Mk IV ‘arrowhead’ radar for the night-fighting role in a retrospective programme starting in September 1940. 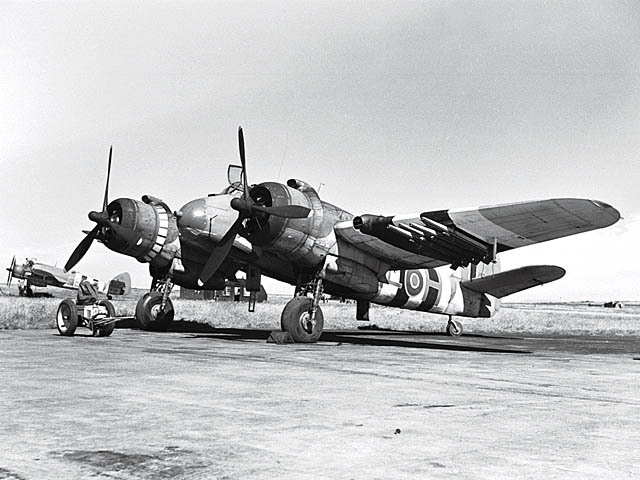 The aircraft was adopted for Coastal Command service with long-range fuel tanks in place of wing guns and revised crew arrangements, deliveries began to No252 squadron in March 1942. 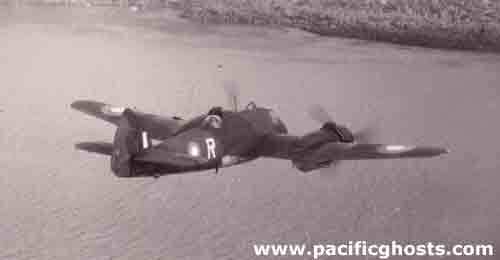 The Coastal Command version was subsequently designated Mk IC and the Fighter Command version Mk IF. Max speed, 306mph (492km/h) at sea level, 323mph (520km/h) at 15,000ft (4,575m). Max cruise, 272 mph (437 km/h) at 15,000ft (4,575m). Initial rate of climb, 1,850ft/min (9.4m/s). Time to 20,000ft (6,100m), 14.1min. Service ceiling, 26,500ft (8,077m). Normal range 1,170 miles (1,883km) at 182mph (293km/h) at 5,000ft (1,525m). Empty weight, 14,069lb (6,382kg). All up weight, 21,100lb (9,435kg). Span, 57ft 10in (17.63m). Length, 41ft 4in (12.60m). Wing area, 503sqft (46.73m²). 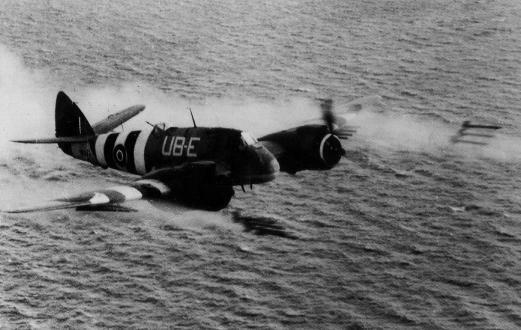 Bristol Type 156 Beaufighter X: The Mk VI (ITF) upon which this was based was a Mk VIC adapted as a torpedo carrier for Coastal Command service after prototype trials were carried out in April/May 1942. It could carry one British 18in (450mm) or US 22½in (570mm) torpedo mounted externally under the fuselage. It was powered by the 1,670hp Hercules VI engines. 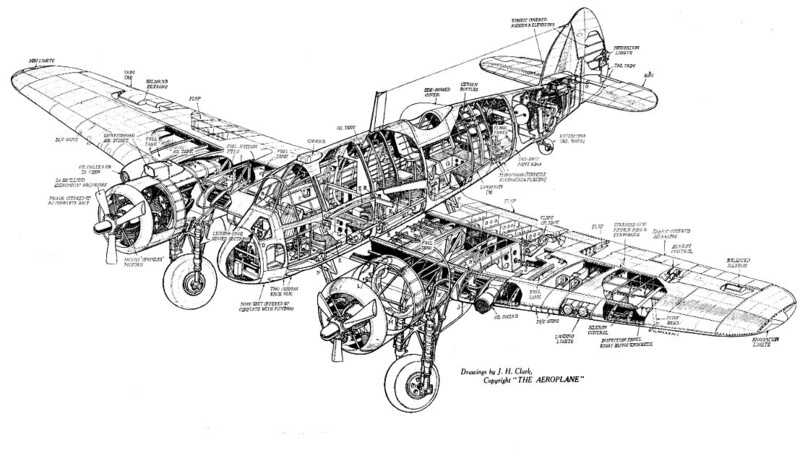 The Mk X had 1,770hp Hercules XVIII engines for improved low altitude performance. Armament consisted of one 0.303” (7.7mm) Browning or Vickers ‘K’ gun in the observers cupola for rear defence. The AI Mk VIII in ‘thimble’ nose, long dorsal fin, enlarged tailplane, increased ammunition load for nose cannon, provision for a third crewman behind pilot to assist in aiming torpedo and provision for underwing rocket projectiles and/or 1,000lb (454kg) bombs and for two 500lb (227kg) bombs under the fuselage in lieu of torpedo. 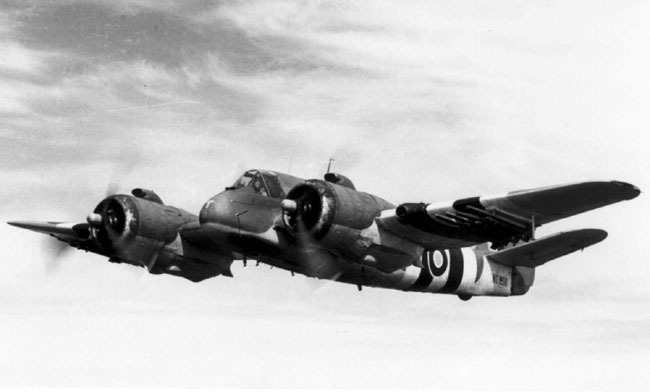 Operational from early 1944 with Bristol Beaufighter strike wings in Coastal Command. Max speed, 303mph (488km/h) at 1,300ft (396m). Max cruise, 249mph (401km/h) at 5,000ft (1,525m). Range, 1,470miles (2,365km) at 205mph (330km/h) at 5,000ft (1,525m). Service ceiling, 15,000ft (4,575m). Empty weight, 15,600lb (7,082kg), All up weight, 25,200lb (11,440kg). 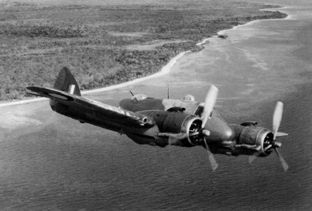 Direct offset to Australia for renumbering in the RAAF A19 series. More Information on this aircraft will appear here when researched and available. Built at Weston and to the RAAF. More Information on this aircraft will appear here when researched and available.